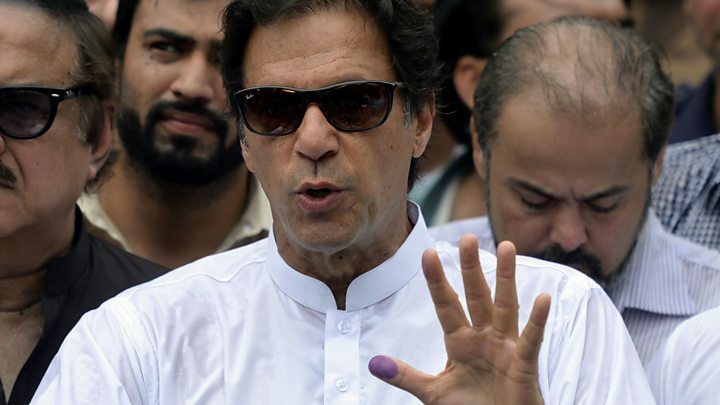 A group of Pakistani political parties has rejected the results of Wednesday's general election that looks poised to bring ex-cricketer Imran Khan to power. Mr Khan's PTI party is ahead in the poll and has declared victory, but rival parties allege vote rigging. 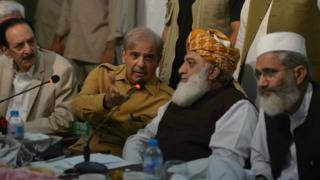 Sitting alongside him at a news conference, Maulana Fazalur Rehman, leader of the MMA party and spokesman for the group of rival parties, said: "We will run a movement for holding of elections again. There will be protests." With most votes counted, Mr Khan's party is leading with 115 seats in the 272 National Assembly constituencies being contested, far ahead of the PML-N on 64. A total of 137 seats is required for a majority and while Mr Khan is on course to become prime minister, he will have to form a coalition government. Interestingly, the party of Nawaz Sharif appears undecided about boycotting parliament. Earlier, Mr Sharif's nephew said they were ready to sit on the opposition benches. But hours later his party joined the opposition alliance calling for a re-run. Mr Sharif's PML-N is also desperately trying to form a regional government in Pakistan's most populous Punjab province. Though it has emerged as the single largest in the assembly elections there, it has failed to secure an outright majority. It appears that the party is keen to retain Punjab, its traditional stronghold, as it cannot form a government at the federal level. But Mr Khan's PTI party, which is only a few seats behind the PML-N, is also in the fray to form a government in Punjab with the support of smaller parties and independents. The next few days are going to be busy for deal makers and the PML-N may not want to be left with nothing. Mr Khan, 65, has faced accusations that his campaign benefited from the backing of Pakistan's powerful military, a claim both he and the army deny. On Friday, the US expressed concern about "flaws" in the campaign process. "These included constraints placed on freedoms of expression and association during the campaign period that were at odds with Pakistani authorities' stated goal of a fully fair and transparent election," the US State Department said. On Thursday Mr Khan - who captained Pakistan to a World Cup victory in 1992 - said the vote had been the "clearest, fairest election Pakistan has ever had". What has Nawaz Sharif's party said? Earlier on Friday, senior PML-N leader Hamza Shahbaz Sharif said the party had "reservations" over the way the election was held, but it would concede victory in order to "strengthen democracy in the country". Nawaz Sharif, who is in prison after being convicted on corruption charges he disputes, said the election had been "stolen".